What was the American Revolution? This past February I got to give a lecture to some middle schoolers at a Christian school on a topic of my choice within the field of history. I chose to discuss the founding period of our nation, which was a very fun topic to study and then speak about. I am putting my notes up here both for my own safe-keeping and in the event than anyone else might find them interesting. I haven’t edited them from lecture format, so bear with the unpolished nature of the writing. What I would like for us to think about during out time together is the history of the founding period of our nation – that period of time from roughly 1775 to 1800 when our nation as we know it came to be. The question I want to pose to govern our time is “what was the American Revolution?” – that is, what did our founders actually achieved when they rebelled against Great Britain and set up a new form of government? From a historical standpoint, what did this accomplishment consist of? And I what I want you particularly to see is how incredibly improbable and desperate and unlikely the American cause was at the time. We tend to look back and see it as inevitable because we cannot imagine the world without it, but at the time, it was almost a miracle that it turned out like it did. Success was only achieved by strenuous effort, deep suffering, fervent patience, and a good amount of apparent luck. The fact that we live in this nation with the freedoms that we have is really an amazing thing. And its good for us to reminded of what actually happened and what it cost the people who led the revolution so that we don’t take it for granted that we live here and have the rights and freedoms that we do. Greater historical understanding of what our nation’s founding is a huge help to us today, both in making us grateful for the sacrifices others have made from which we are blessed, and in teaching us what it means to live as responsible citizens today. So I’d like to suggest 5 initial thoughts as to what the American Revolution was. First, it was a military miracle. Now imagine yourself as an American soldier in the Revolutionary War. You’ve signed up because you believe in the cause of liberty – you’re tired of high taxes when you don’t have any vote in Parliament. And so you’re fighting as a solder under General George Washington in the Continental Army. Lets say its the winter of 1777-1778, a few years after the war began. Most of your friends who volunteered with you are gone – either they have deserted (because its not a standing army yet, so people can come and go relatively easily), or they have been captured by the British and sent to prison ships (in which case you are almost as good as dead), or they have been killed by disease (which claimed the lives of thousands of more than twice as many American soldiers than actual combat), or they have died in combat (for example, in the battles in New York and New Jersey in late 1776). And so for the winter Washington stakes in Valley Forge, a bit NW of Philadelphia. And just before winter hits, something absolutely disastrous happens which makes this the low point of the war for the American cause – the supply line dries up and stops altogether. That means that you’re no longer getting a supply of food of clothes. So if you are a solder in George Washington’s army at this point, you may not have much clothing beyond some tattered rags, which aren’t nearly enough to keep you warm – at Valley Forge it gets about as cold during the winter as it does here in Princeton – can you imagine living outside in a tent or a cabin all winter, in a day without central heating, without a proper coat? You may not have any shoes, you may be fighting sickness, and you certainly don’t have much to eat, especially in February when the whole army goes down to half-rations to try to survive. Over the course of the winter, somewhere around 2,000 soldiers died from disease, malnutrition, and exposure, which was about 1/6 of the total army. When visitors would walk by, the solders would yell, “famine, famine.” The desperation was intense, and some of the things that happened that winter were truly barbaric. Washington feared that the army was on the verge of collapse. Now here’s the point – that army – that rag-tag, untrained volunteers, lacking supplies and clothing and food, barely able to march, defeated the most powerful military force in the world, namely, the British army and navy. Do you hear what he is saying? He is basically saying, “if you tell the story as it happened, people won’t believe it. They will think its fiction, not history.” Amazing! How did they do it? Basically they won because it wasn’t a conventional war. Usually, if you captured the capital city of the opposing side, you won the war. For example, you attacked France, you won if your troops arrived in Paris. That was victory. But not so in this war. The British could occupy New York, Boston, Philadelphia, Savannah, control American seaports, and routinely win battles, and they did all these things – but that did not end the war. They had to destroy the American army and crush the American resolve to win the war. The Americans didn’t really defeat the British as much as outlast them. That was Washington’s genius – he was good at retreating. He lost more battles than he won, but he kept the army together. And as long as the Americans still had an army, the war was not technically over. Two other factors were key – first, French support (they gave supplies quietly from the start, and officially entered the war after the American victory at Saratoga). Second, the distance of Great Britain from the colonies was important. Conducting a war from across the Atlantic ocean without the internet or radio or telephones was a tricky thing – it meant your supplies and troops were always about 2 months too late, and every soldier had to be sent across the ocean. Well, lets move on. That was about how the revolutionaries fought against their mother country, now lets talk about why they fought. First, separation of church and state. The founders of our nation came up with a really novel idea, something that had not been tried before on any large scale: they said, “I know – lets make religion and government separate things. Lets stop letting the government decide which religion or sect to make the legal and official one and then persecute everyone of a different religion. Lets stop doing that, and instead, lets just let people be free to choose their own religion.” That seems very normal to us, but at the time, after century after century of bloody persecution in Europe, that was a really novel idea. This does not mean there was no Christian influence in the founding of our nation, but it does mean that our nation is not a “Christian nation” in the sense that, say, Great Britain was in the middle ages. Second, popular sovereignty. That just means the authority of the government is in the people. And we express that authority by voting for people to serve in government and represent us. Now again, that sounds normal to us, but that was a really a novel concept at the end of the 18th century. At that time most people believed that democracy could not exist on a national level. They thought, “maybe if you live in a Greek city-state or a small Swiss canton you can vote for your leaders, but for a whole nation, you have to have more stability than that.” The American Revolution proved that wrong. It showed representative government really could function and even flourish on a larger scale. And that has changed the whole world. Third, the balance of government power by checks and balances. Most people up till that time – thought that to have effective leadership you have to have one central authority – a ruler, or a group of rulers – so they can enforce things. 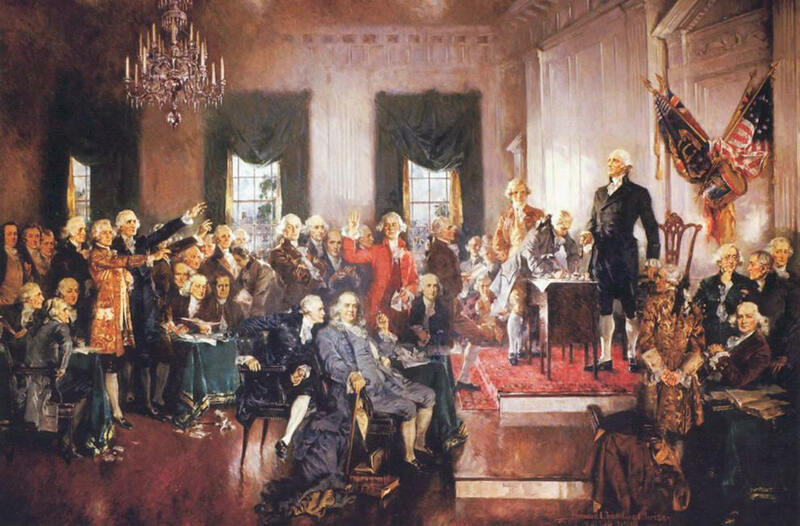 Our founders showed that you can have a government that divides up the power and still works efficiently, and that dividing up the power helps keep the government in check. So they divided up the power between the federal government and the states, and then also between the various branches of the federal government – the executive, legislative, and judicial. Many of these things had not been tried in this way. We could also talk about things like freedom of speech and trial by jury at this point, but you get the idea, and we need to move on. 3) Third, the American experiment was a collaborative effort. What do I mean by this? Well, the founders had to work together. It wasn’t just one man’s crusade. In fact, many historians have argued that the reason the American revolution was effective where other revolutions (say, the French Revolution) failed was because of the diversity of the founders. It didn’t become bound up with one person, or even one party or ideology (the fighting between two parties in the 1790’s was as fierce as its ever been since). As the historian Joseph Ellis has put it, just as you had a formal system of checks and balances in the Constitution, you almost had an informal system of checks and balances in the personalities and ideologies of the founders. They helped restrain each other from excess and canceled out each other’s blind spots. They were strengthened by this diversity. Thomas Jefferson and John Adams are a good example. They had passionate differences, both political and personal, and they went to their grave arguing with each other in letters about what it was they had accomplished. But those differences kept our nation from spinning out of orbit. Politics were as partisan and cut-throat back then as they are today. The amount of backstabbing in the election of 1800, for example, where Thomas Jefferson beat John Adams, was unbelievable. And the cartooning and slandering between the Federalists and Democratic-Republicans in the 1790’s was vicious. And yet – here’s the point – no one party triumphed over the others and stamped them all out. Rather, the differences were tolerated. More than tolerated, they were stamped onto the fabric of our national consciousness, so that freedom of dissent has come down to us as a party of the legacy. And there is strength in this diversity, for again, it kept the nation from flying out of orbit. 4) Fourth, the founding of America was a historical improvisation. The founders didn’t just get together and hammer everything out all at once. It was a long process, which took sudden turns and required constantly adjusting and adapting to different scenarios. It played out in real history, with lots of unexpected changes and bitter compromises along the way. You can see a lot of developments, for example from the writing of the Declaration of Independence to the writing of the Constitution. When was the Declaration of Independence written? 1776. When was the Constitution written? 1787-88. In those intervening years the Americans had to both fight a war and attempt some kind of self-government (which they did under the Articles of Confederation in the early and mid-80’s). Both of these processes had exposed their need for stronger national unity, so that national mood shifted from distrust of centralized power to fear of anarchy and chaos. The “spirit if 76” melted away a good deal. And a good thing, too. Without the bitterness of war and the failure of the Articles of Confederation, the Constitution as we know it would likely have never been written and ratified. Even so, it was a fierce battle, with people like Patrick Henry bitterly opposing it. You can see many of these developments in James Madison’s career, for example. In the late 1780’s he supported strong, centralized government. Then in the 1790’s he favored states’ rights. Then as President during the War of 1812 he supported a strong federal government again. So was he just a flopper? No, he was responding to different pressures at different times. The danger of anarchy under the Articles of Confederation during the late 80’s was a different danger than the danger of Alexander Hamilton’s vision of centralized power in the 90’s, for example. The founders were doing a juggling act, trying to strike the fine balance between too little centralized power and too much. As David McCullough has said many times, it was really a miracle it turned out like it did. 5) Finally, and most briefly, the founders’ achievement is a mixed legacy. Obviously from what I have already said its clear that it was an amazing accomplishment, and we should be grateful for the sacrifices people made to give us the rights we have. But there are also some darker parts of our past that we cannot forget about, most notably slavery and the treatment of Native Americans. I see slavery especially as the ultimate failure of the revolutionary generation for two reasons. First, not only was slavery a heinous evil, but it was the very kind of evil which was most blatantly at odds with the Revolution ideals, namely freedom and equality. When Thomas Jefferson wrote that “all men are created equal,” he owned over 200 slaves. He did not free them when he died. Of all people, they should have known better. “We know full well what (the founders) could perceive dimly, if at all – namely, that slavery would become the central defining problem for the next seventy years of American history; that the inability to take decisive action against slavery in the decades immediately following the Revolution permitted the size of the enslaved population to grow exponentially and the legal and political institutions of the developing U.S. government to become entwined in compromises with slavery’s persistence; and that eventually over 600,000 Americans would die in the nation’s bloodiest war to resolve the crisis, a trauma generating social shock waves that would reverberate for at least another century” (Founding Brothers, 88).